The Sultan seen during the Golden Jubilee. The Sultan of Brunei can be thought of as synonymous with the ruling House of Bolkiah, with generations being traced from the first sultan, temporarily interrupted by the 13th Sultan, Abdul Hakkul Mubin, who in turn was deposed by a member of the House of Bolkiah. The Sultan's full title is: His Majesty The Sultan and Yang Di-Pertuan of Brunei Darussalam. Muhammad Shah / Awang Alak Betatar 1368 1402 Established the Sultanate. Sharif Ali / Sultan Barkat (Blessed Sultan) 1425 1432 No direct genealogical relation to predecessor, but was selected as he was the son-in-law of the previous sultan (Ahmad) and was well versed in Islam. Sulaiman 1432 1485 Son of the previous sultan, Sharif Ali. Abdicated to allow his son Bolkiah to become sultan. Bolkiah / Nakhoda Ragam (The Singing Captain) 1485 1524 Son of the previous sultan, Sulaiman. Saiful Rijal 1533 1581 Nephew and adopted-son of the previous sultan, Abdul Kahar. Castile War broke out between Brunei and Spain. Muhammad Hassan 1582 1598 Younger brother of Shah Berunai. Muhammad Ali 1660 1661 Strangled by his successor Abdul Hakkul Mubin, sparking the Brunei Civil War. Abdul Hakkul Mubin 1660 1673 Started the Brunei Civil War by killing his predecessor Muhammad Ali and was in turn killed by Muhyiddin who succeeded him as Sultan. Muhyiddin 1673 1690 Son of Abdul Jalilul Akbar who avenged the death of his father-in-law Muhammad Ali by killing Abdul Hakkul Mubin, thus ending the Brunei Civil War. Hussin Kamaluddin 1710 1730 He ruled for the second time between 1737 to 1740. Muhammad Alauddin 1730 1737 Instructed Datu Imam Yaakub to write the Silsilah Raja-Raja Berunai or the Genealogy of the Sultans of Brunei. Muhammad Tajuddin 1778 1807 Ordered Khatib Abdul Latif to inscribe Batu Tarsilah or Stone Tablet. Omar Ali Saifuddin II 1828 1852 Brunei ceded some territories of Sarawak to James Brooke. Brunei ceded Labuan to the British. Abdul Momin 1852 29 May 1885 Brunei ceded northwestern part of Borneo to the British. The declaration of Amanat took place in 1884 that vowed not to cede more Brunei territories to foreign powers. Hashim Jalilul Alam Aqamaddin 29 May 1885 10 May 1906 United Kingdom established protectorate over Brunei in 1888. Muhammad Jamalul Alam II 10 May 1906 11 September 1924 The Sultan's reign was a short one. An outbreak of malaria claimed his life as well as three members of his family. Ahmad Tajuddin 11 September 1924 4 June 1950 Japanese occupation of Brunei took place. Omar Ali Saifuddien III 4 June 1950 5 October 1967 Signed the Brunei Constitution of 1959. Abdicated voluntarily in favor of his eldest son, Hassanal Bolkiah. Became Brunei's first Minister of Defence after independence in 1984. Hassanal Bolkiah 5 October 1967 Incumbent Brunei regained independence from the United Kingdom in 1984. ^ a b "Prime Minister". The Prime Minister's Office of Brunei Darussalam. Retrieved 24 April 2011. ^ a b "Sultan-Sultan Brunei" (in Malay). Government of Brunei. Archived from the original on 15 April 2015. Retrieved 24 April 2011. ^ a b Elisseeff, Vadime (January 2000). "Chapter 8: A Brunei Sultan of the Early Fourteenth Century – A Study of an Arabic Gravestone". The Silk Roads: Highways of Culture and Commerce. Berghahn Books. pp. 145–157. ISBN 978-1-57181-222-3. Retrieved 26 December 2013. The Brunei dollar, has been the currency of the Sultanate of Brunei since 1967. It is normally abbreviated with the dollar sign $, or alternatively B$ to distinguish it from other dollar-denominated currencies. It is divided into 100 sen (Malay) or cents (English). The Brunei dollar is issued by the Autoriti Monetari Brunei Darussalam. Mohamed Bolkiah is a member of the royal family of Brunei. He is the second son of Omar Ali Saifuddien III, the 28th Sultan of Brunei, and Raja Isteri (Queen) Pengiran Anak Damit. He is the Head of the Brunei’s Viziers. After Brunei’s independence in 1984, he became the country’s first foreign minister, serving from 1984 until 22 October 2015. He served in the cabinet as the Minister of the Brunei's Ministry of Foreign Affairs and Trade alongside the second Minister of Foreign Affairs and Trade, Lim Jock Seng. DYTM Paduka Seri Begawan Sultan Haji Sir Muda Omar Ali Saifuddien III was the 28th Sultan of Brunei who ruled from 4 June 1950 until his voluntary abdication from the throne on 5 October 1967. He was also Brunei's Minister of Defence after the country's independence. He was known as "The Architect of Modern Brunei", "The Royal Poet", and "The Father of Independence". Crown Prince Haji Al-Muhtadee Billah; is the Crown Prince of Brunei Darussalam. He is in the first in line of succession to become the next Sultan of Brunei. He holds the position of senior minister of the Prime Minister's Office of Brunei, General of the Royal Brunei Armed Forces and Deputy Inspector General of the Royal Brunei Police Force. The Prime Minister of Brunei is the head of government of Brunei. Concurrently, the title is held by the Sultan of Brunei, who is also the head of state of the country. As the Prime Minister, the Sultan and Yang Di-Pertuan is the head of both the ministerial cabinet and the Legislative Council of Brunei. 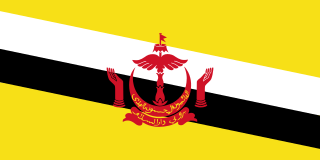 The Bruneian Empire or Empire of Brunei, also known as Sultanate of Brunei, was a Malay sultanate, centred in Brunei on the northern coast of Borneo island in Southeast Asia. Bruneian rulers converted to Islam around the 15th century, when it grew substantially since the fall of Malacca to the Portuguese, extending throughout coastal areas of Borneo and the Philippines, before it declined in the 17th century. Princess Masna, is the sister of Sultan Haji Hassanal Bolkiah Muizzaddin Waddaulah. She was born in 1948 and is married to Yang Amat Mulia Pengiran Lela Cheteria Sahibun Najabah Pengiran Anak Haji Abdul Aziz bin Pengiran Jaya Negara Pengiran Haja Abu Bakar, the Head of Adat isitiadat Department. He was also the Grand Chamberlain and Controller of the Royal Customs and Excise Department. Brunei–Russia relations is the relationship between the two countries, Brunei and Russia. Brunei maintains an embassy in Moscow, whilst Russia's ambassador to Malaysia is accredited to Brunei as a non-resident ambassador. The politics of Brunei take place in a framework of an absolute monarchy, where by the Sultan of Brunei is both head of state and head of government. Executive power is exercised by the government. Brunei has a legislative council with 36 appointed members, that only has consultative tasks. Under Brunei's 1959 constitution, His Majesty Paduka Seri Baginda Sultan Haji Hassanal Bolkiah Mu'izzaddin Waddaulah, is the head of state with full executive authority, including emergency powers since 1962. The Sultan's role is enshrined in the national philosophy known as "Melayu Islam Beraja" (MIB), or Malay Islamic Monarchy. The country has been under hypothetical martial law since a rebellion occurred in the early 1960s and was put down by British troops from Singapore. The House of Bolkiah is the ruling royal family of Brunei Darussalam. It is composed of the descendants of the 1st sultan Sultan Muhammad Shah and his family. The Sultan of Brunei is the head of state and absolute monarch of Brunei. He is also head of government in his capacity as Prime Minister.